Well, I still have to finish the Ich Bin Ein Berliner series sometime, but baseball has intervened again. Last week was a big baseball week. 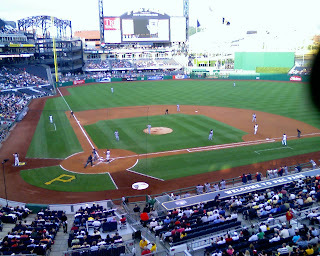 I was in Pittsburgh early in the week for a meeting and managed to get several of us invited to a suite at PNC Park for a Pirates - Nationals game. The Pirates ended up losing, but it was a pretty good game, and the suite was sweet. By the way, if you ever find yourself in Pittsburgh, don't leave until you've found your way to Primanti Bros. They have a few shops around, but try the original. Their No. 1 and No. 2 sellers look pretty much like this. The sandwiches come with fries and slaw. On the sandwich. Yup, everything right on the sandwich. It's great! No. 1 and 2 sellers, you ask. 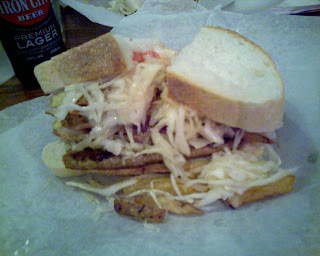 Well, the cheesesteak sandwich (not a Philly cheesesteak - it's the Primanti Bros. version) is the No. 2 seller. I asked our waitress what was No. 1. She said, "You already have it." Look closely and you'll see a bottle of Iron City in the background. It's No. 1. Got home Thursday morning and took the rest of the week off. 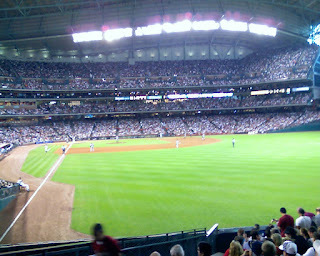 Thursday afternoon the Astros had a 1:05 game with the Brewers. They lost. However, as the game was about to start, everyone else on my hallway at the office comes trooping in. Seems someone scheduled a "meeting" at the ballpark. There are all too few afternoon games anymore anyway, so it would be a shame to work through them, right? Then we're into the weekend, and a three game series with the Yankees. 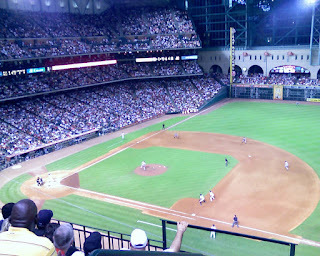 Although it was fun to have the Yankees in town, things didn't go well for our 'Stros. First game - Friday night. My bride and I went. For that game, we didn't have our usual Section 328 seats. We had been able to get bullpen boxes - pretty much down the right field line. They have cup holders out there. No cup holders in 328. We were on the aisle of a row of extremely busy people. I think everyone in the row made at least 3, maybe 4, trips out and back. Bladder issues? I don't know. We got posters, too. Yankees - 2, 'Stros - 1. Saturday evening, back to 328. No cup holders. But 328 is strategically placed - close to the restrooms, the nacho stand, and the cart that sells the 24 oz. beers. Got rally towels at that game. So, I'm sitting there watching the game with No. 2 son, and it's about the sixth inning or so. Some younger guy with a microphone and trailing a cameraman taps me on the shoulder and says, "You've been picked to do the Scratch Off Guess the Attendance Contest. Do you want to play?" Well, sure! Why not? So the inning ends, we stand up, and there I am on the Jumbotron. Yup, much larger than life. Wearing my 2005 National League Champions shirt and my official Enron Field cap. The contest works like a lottery scratch-off ticket. They scratch off the last three numbers, and then give you a clue about the first two. The last three were 409. Nice start if you like vintage Chevys or Beach Boys songs. Then the clue - Mad Magazine introduced a sport called ____-Man Squamish. I've been known to read Mad (What? Me worry?) from time to time, but this didn't ring a bell at all. However, being an engineer with at least reasonable deductive reasoning skills, remembering that the previous night the attendance had been 43,078 or something like that and knowing that the Yankees series was sold out, I took a chance (not a big chance, but still a chance) on 43. It was, of course, correct. Yes!! I win!! The prize? Check it out. A $10 Best Buy gift card. Thanks, Drayton! The Rally Towels didn't seem to help much. Final score: Yankees - 8, 'Stros - 4. 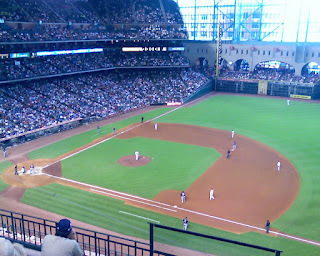 I didn't go to game 3 of the series, but it ended badly for our Astros. 13-0 badly. The 'Stros continue to struggle. "Ray, people will come Ray. They'll come to Iowa for reasons they can't even fathom. They'll turn up your driveway not knowing for sure why they're doing it. They'll arrive at your door as innocent as children, longing for the past. Of course, we won't mind if you look around, you'll say. It's only $20 per person. They'll pass over the money without even thinking about it: for it is money they have and peace they lack. And they'll walk out to the bleachers; sit in shirtsleeves on a perfect afternoon. They'll find they have reserved seats somewhere along one of the baselines, where they sat when they were children and cheered their heroes. And they'll watch the game and it'll be as if they dipped themselves in magic waters. The memories will be so thick they'll have to brush them away from their faces. People will come Ray. The one constant through all the years, Ray, has been baseball. America has rolled by like an army of steamrollers. It has been erased like a blackboard, rebuilt and erased again. But baseball has marked the time. This field, this game: it's a part of our past, Ray. It reminds of us of all that once was good and it could be again. Oh... people will come Ray. People will most definitely come."